I now have a new approach. The prior approach used one set of fundamental accounting concepts and relations between those concepts for all entities. The new approach groups entities into currently 81 groups and provides a set of fundamental accounting concepts and relations between those concepts. Why? Because that is what the data says. So, the last results I provides showed that 63.1% of entities passed all conformance tests, that dropped to 60.0%. I don't think that is because quality is going backwards, it is because my testing is getting better based on feedback I am receiving. 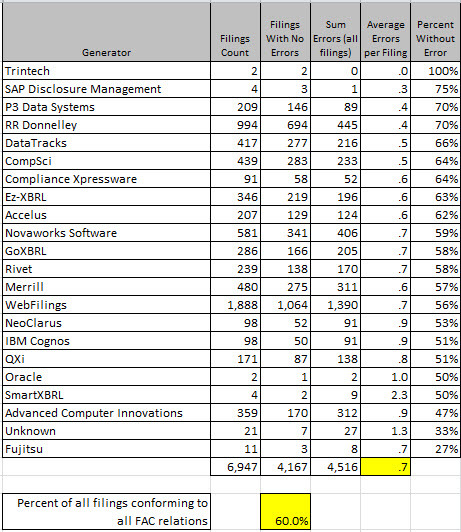 Most issues can be proven to be filer error, 67.9% approximately. 290 or so appear to be cause by missing US GAAP XBRL Taxonomy concepts. And the remaining 1,159 are likely caused by bugs or errors that I still have in my process (in the mapping rules or in the impute rules, this is still a work in process). So basically the point is that why filers don't conform can be explained. So basically, somewhere between 96.9% and 98.7% of all fundamental accounting concept relations are conformed to and 60% of all reporting entities conform to 100% of these relations currently. I realize that this is a lot of information. When people talk to me I commonly get the feedback that they feel like they have a 4 and 1/2 inch fire hose shoved into their mouth. So here is information that you can read about that puts all these pieces together for you. Read it at your own pace. Trust me, this is important information. But while this is important to understand, stay tuned to understand what it all means. Oh, almost forgot. Here is the comparison of the analysis periods.